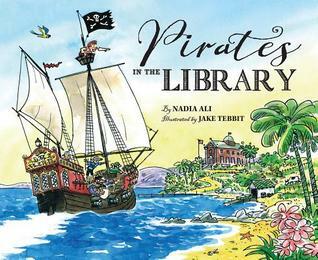 Pirates in the Library, written by Nadia Ali and illustrated by Jake Tebbits, tells the tale of a band of pirates and their search for treasure. And where do they find that treasure? In the library, of course! 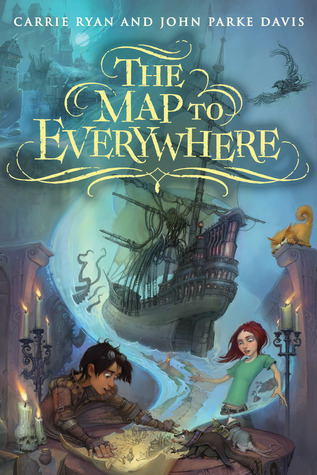 With the help of Ms. Benitez, the librarian, and the Dread Pirate Dewey’s map, Captain Jake and his crew (including their parrot) explore the library and find more treasure than they ever expected. The librarian in me is thrilled with this book’s take on what treasure really is, but I would have liked more of an overview of the Dewey Decimal System within the text instead of it just being alluded to or included on endpapers or at the book’s conclusion. I may add this book to my school library collection, simply because it celebrates books, libraries…and pirates. I won’t, however, use it to introduce Dewey, and that is a shame. Fin, a young thief living in the treacherous land of Khaznot Quay, is a boy who is easily forgotten. Seriously. As soon as someone meets him, they forget he ever existed. Pretty handy if you’re a thief, especially one surrounded by pirates, con artists, and, well, other thieves. Not so much if you need help looking for something…or someone. Marrill is a girl who’s just been handed a shock, and she’s trying to make sense of her new circumstances. That is going to be much more difficult after she sees a huge ship sailing through what was a parking lot just minutes ago. So what does Marrill, girl adventurer, do? She climbs aboard the ship…and quickly realizes that she can’t find her way back home. Marrill does have a bit of hope, though. The ship she’s currently on is home to a wizard, Ardent, and his companion, Coll. This unlikely pair is looking for a mysterious map. The Map to Everywhere. This map will lead anyone wherever they need to go. So what’s the problem? Well, the map is in pieces, and it could be quite the quest to find the pieces and put them together. Marrill, Ardent, and Coll will have to navigate the magical waters of the Pirate Stream to even attempt their mission. Marrill and company sail into Khaznot Quay. After getting herself into a sticky situation, Marrill encounters Fin (who is also in a sticky wicket of his own). Unlike everyone else he’s ever met, Marrill actually remembers him, and Fin is eager to hold onto that tenuous connection to someone. He stows away on Marrill’s ride, and joins the crew’s search for the Map to Everywhere (an object that he’d also like to get his hands on). Also, Fin would kind of like to get away from the Oracle, an evil wizard who spreads sorrow wherever he goes. Fin has something that the Oracle wants, and this shadowy figure will stop at nothing to claim his prize. It seems he is also searching for this powerful map, but what he wants to do with it could be devastating for everyone, everywhere. Now, Marrill, Fin, Ardent, and Coll are on the hunt for the pieces of the Map to Everywhere, each for their own reasons. Can they work together to complete this dangerous puzzle before everything is torn from them? Will they succeed in their quest to bring the Map together, or will the Oracle beat them to it? Will Marrill ever find her way home? Will Fin find what he’s looking for? Nothing is certain, but one this is clear. We’re in for one heck of an adventure! To learn more about this fantastical tale, go to http://www.themaptoeverywhere.com/. 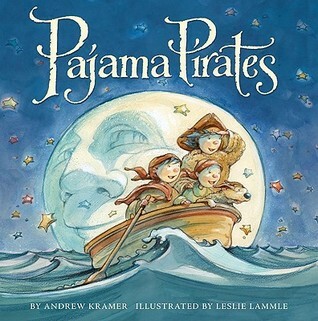 I really wanted to like Pajama Pirates, written by Andrew Kramer and illustrated by Leslie Lammle, but the rhymes were inconsistent and don’t lend themselves well to read-alouds. The illustrations in this book were wonderful and engaged the imagination. I almost think this book would have been better if it had been a wordless picture book. This might be a great bedtime book for an early independent reader who loves pirates. The Gingerbread Pirates, written by Kristin Kladstrup and illustrated by Matt Tavares, is a perfect Christmas book for boys–or anyone who loves pirates! When Jim gets the idea to make a crew of gingerbread pirates, he never expects them to come to life. When Jim is sleeping and waiting on Santa to arrive, the pirates, led by Captain Cookie, try to band together so that this mysterious Santa Claus doesn’t eat them. When they meet the jolly old man, however, the pirates are in for a bit of a surprise. It seems that Santa has a gift for even them! 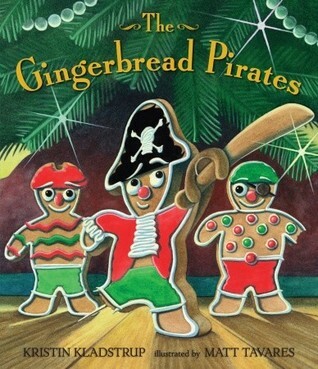 After reading this book, I foresee lots of children trying to make their own gingerbread pirates in the hopes that the cookies will come to life and have an adventure of their own. That should make for a fun Christmas Eve! 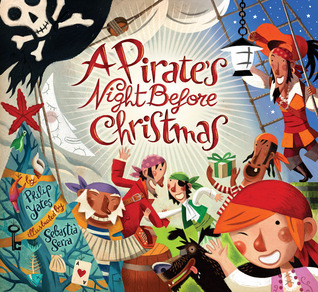 A Pirate’s Night before Christmas, written by Philip Yates and illustrated by Sebastia Serra, is definitely a departure from the traditional ‘Twas the Night Before Christmas tale. The rhymes are set up in a similar fashion, but imagine if you will a Christmas Eve aboard a pirate ship. The pirates are not “nestled all snug in their beds,” and they’re not waiting on Santa Claus. No, they are doing pirate things–”snorin’ like pigs,” dreaming of treasure chests, watching for approaching ships–and waiting on Sir Peggedy (the pirate’s Santa) to appear. And appear he did, but Sir Peggedy is about as different from Santa as it’s possible to get. He does drive a sleigh, but it’s pulled by eight seahorses. (Sir Peg arrives out of the sea, by the way.) Sir Peggedy is fat, dresses in black, is covered in seaweed, has a patch over one eye, scars on his face, a gold tooth, a hook for one hand, a peg for one leg, and a skull earring. But, like the Santa we all know, Sir Peggedy does give presents to pirates on Christmas Eve. Some of those presents we might not want–like hardtack, a plank, or eggs–but others, like a map to buried treasure, would be welcome gifts to pirates and land lubbers alike! This is a great twist on the traditional tale we all know and love. An extremely helpful–and funny–pirate glossary is included at the back of the book for those who are unfamiliar with pirate slang. This book might make an excellent starting point for students writing their own versions of ‘Twas the Night Before Christmas. How cool would it be to imagine how Star Wars characters, superheroes, aliens, animals, or other things view Christmas Eve!